Lexington, KY – August 12, 2015 – It was nearly one year ago that Jennifer Alfano spotted Castle in a schooling ring in Houston, Texas. Fellow professional rider Tracy Fenney was aboard the bay gelding, and after Alfano saw him take two jumps, she knew that she wanted to be the rider in his saddle. Her instincts proved correct as she topped the 2015 USHJA Pre-Green Hunter Incentive leader board Wednesday with the warmblood, owned by Sharon O’Neill of Snyder, New York, on the second of the three-day championship event. Alfano rode Castle to the scores of 86.5, 89 and 91 to not only take the first place as the high scoring round of the day, but also guaranteeing a return spot in Thursday’s championship round. “Castle was great both days; he is really consistent. He is one of those horses you can really count on. You can really depend on him,” Alfano described. Her cumulative score of 527.55 points from the two days of competition allows for them to return as the 10th horse and rider combination of the class on Thursday. Alfano nearly duplicated her effort with The Exchange, who she placed third with on the opening day, yet an unfortunate lead change would drop them from the top 30 qualified for the championship round. Alfano has been a proponent of the USHJA Pre-Green Incentive program since its inception in 2013. Over the last three years, she has watched it continue to grow exponentially, and is thrilled with the increase of owners and riders at the 2015 Championship. Going into the championship round on Thursday, Alfano and Castle will have their slate wiped clean. She is relying on his consistency to help her clinch the victory, a feat which has narrowly evaded her in the past. Scott Stewart continues to lead the overall ranks with Evermore, returning as the last contender of the event. They hold the lead with a total of 529 points, but Thursday will become anyone’s game. Stewart also qualified Wish, owned by Rivers Edge, ranking fifth during the second over fences phase, and tied with Hunt Tosh and Liberty Road, owned by Betsee Parker. Although Stewart took the second position with William Hill during the second round, their first-day rail will keep them from the final phase of competition. “Evermore is so laid back; I hope he has some energy left, but I think he will be good,” Stewart smiled. Third place was awarded to Kelley Farmer and Clever Conversation, owned by Kensel, LLC. Farmer qualified five mounts for the final round, holding the best odds as the busiest rider of the class. Tosh finished in fourth place with Valhalla, owned by The Wheeler Family, qualifying three mounts for the concluding round. The 2015 USHJA Pre-Green Incentive culminates Thursday with the third and final round of the competition, where the top 30 horses from Tuesday and Wednesday’s rounds will compete in a final over fences round. The final round will feature a “clean slate” format, meaning the scores from Tuesday and Wednesday will not carry forward. 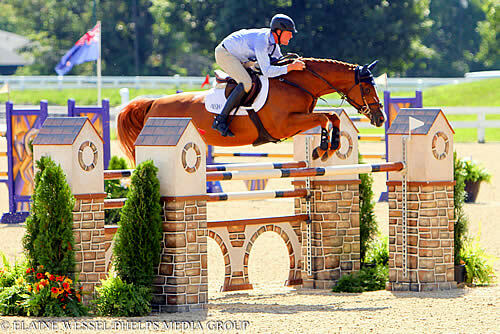 Lexington, KY – August 12, 2015 – Now into its second day of competition, the Bluegrass Festival Horse Show brought 23 eager entrants to the Rolex Stadium to compete in the first day of jumper action, highlighted by the 1.40m Open Jumper class that concluded the afternoon. Riders faced off against the clock over a speed course, and mid-way through the pack, Peter Wylde and Royal Flush, owned by Kathleen Kamine of Oldwick, New Jersey, took their chance at the blue. They bested the current leader’s time of 63.274 seconds, set by Denise Wilson and Nimbus, with the faster 62.467 second round. Although 11 pairs tried to chase down Wylde and his speedy mount, none were able to overtake them. Looking at her pedigree, Royal Flush has a lot to live up to, but she seems to have taken the challenge in stride and has been living up to her name, perhaps even making a name of her own. “Royal Flush is a wonderful horse. She was bred by the people that own her, the Kamine family. She is the daughter of Royal Kaliber, which was their Olympic horse, and she is out of a mare called Wildana, another grand prix horse that they owned. She is really home-bred,” Wylde said. In the past four competitions in which the mare has participated, she has earned two champion finishes, two reserve spots, and two third place positions, rarely finishing off the podium. In the only Grand Prix of her show career, Royal Flush finished an impressive third. Wylde picked up the ride on the 9-year-old at the end of last summer, and sung nothing but praises for the horse that he thinks is one of the next up-and-comers in the jumper ring. The time set by Wilson and Nimbus was good enough to maintain their place just behind the first place finishers, followed by Meagan Nusz aboard Vesuvius, owned by Amalaya Investments of Houston, Texas, in the third position. The horse and rider tripped the timers in 64.709 seconds. Eight other duos mastered designer Allen Rheinheimer’s course, leaving all the jumps up and crossing the timer within the time allowed. In the 1.35m Open Jumpers, which took place just prior to the 1.40m Open Jumpers, 25 hopeful entrants took to the expansive ring of the Rolex Stadium to vie for the top prize. Unlike the 1.40m class, where half of the total entries rode to a clean and clear trip, only six pairs conquered the colorful track to make it to the jump-off. The lead consistently changed hands as quicker and quicker trips were produced by each subsequent jump-off effort. It appeared that Carlos Quinones, with the ride aboard Yidam, would be named the winners with their time of 69.803 seconds, that is until Kyle Dewar and his own Gomez Van De Withoeve, nearly the last to go, edged out the frontrunners with their quick marks of 69.282 seconds. Dewar has owned the towering 9-year-old ‘Gomez,’ as he is dubbed outside the show ring, for a year and a half, and the two are starting to put up good numbers after a rocky start to their career together. “He did some grand prix as an 8-year-old, and some days were amazing and some days were terrible, which I think was due to an underlying muscle problem. He was sick through Florida, but now he is very healthy and has won a lot of prizes; we’ve been much more consistent. Since the beginning of June he has been awesome. He is my upcoming grand prix horse,” Dewar said. Gomez is perhaps the definition of a gentle giant, standing at nearly 18 hands and exuding nothing but friendliness. Although he does not exemplify the typical image of a fiery jumper type, his owner has deemed his calm demeanor and hard-working attitude as a major factor in their success. Dewar and Gomez will try to prolong their winning ways this Friday Night in the $25,000 Hagyard Lexington Classic. Quinones and Yidam, owned by Michelle Navarro-Grau of Wellington, Florida, retained their second place position, followed by Daniel Begoya in the saddle for Eduardo Leon of Houston, Texas, aboard Prestige, who claimed third place with their time of 70.260 seconds. Dewar, Quinones and Begoya were the only three to ride to double-clear rounds, with the other three jump-off riders succumbing to downed rails. The Bluegrass Festival Horse Show features five days of exciting jumper competition. The highlight jumper events in the Rolex Stadium include the $25,000 Hagyard Lexington Classic on Friday and the $40,000 Bluegrass Festival Grand Prix on Sunday. For more information on the Kentucky Summer Horse Shows, including this week’s Bluegrass Festival Horse Show, visit www.kentuckyhorseshows.com.